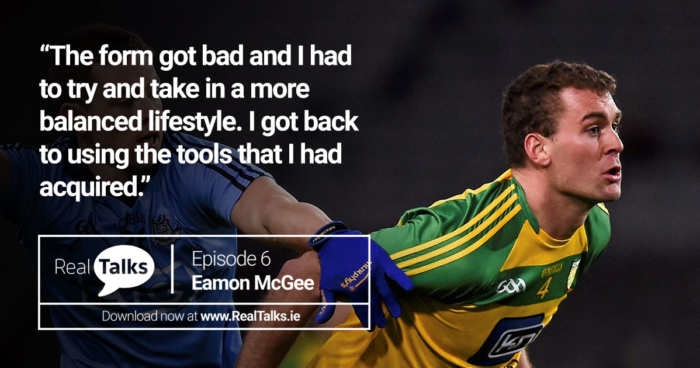 In the latest episode of the Real Talks Podcast with Alan O’Mara, former Donegal defender Eamon McGee covers so many topics in such an honest way, it’s inevitable he’s had national tongues wagging. Eamon opens up to such a degree that he reveals the makings of a man who is truly one of the most engaging and captivating characters in recent GAA history. Eamon McGee was part of the Jim McGuinness side that won matches, won games and brought Sam back to Donegal again, so he knows what’s needed to succeed at the very top. As Eamon explains to Alan, Jim is not a man to suffer fools. You work hard to earn your spot, and you work even harder to keep it. This, McGee feels, is the most imperative thing when it comes succeeding at inter-county level. And while financial backing can help, nothing quite beats putting the hard graft in. When analysing the current state of affairs in gaelic football, the elephant in the room is the dominance of Dublin football. Typically the target of vitriol and scorn from other counties, Jim Gavin’s current crop has been subject to some serious criticism, especially when it comes to money. McGee, however, isn’t having a bar of it. “It annoys me now so much when I see teams giving out about Dublin financially. When we talk about Dublin, nobody is talking about Dean Rock hitting frees. Dean Rock is a completely different player than he was four, five years ago, the hard graft he has put in”, he told Alan. As Kevin McManamon can attest, Dublin players put in the hours to get where they are. You need a certain level of resilience, a skill that is only developed over time and through endeavour. “In terms of leadership and in terms of success, it’s not about the gifts they got from God, or wherever they got them. They’re skills that can be built. It’s lifting weights for your brain, it’s not lifting weights for your biceps,” said Kevin in episode 1 on the Real Talks podcast. It’s not just GAA teams that reap the rewards of working hard. In a similar vein to Malcolm Gladwell’s much-discussed “10,000 hours rule”, McGee cannot place enough emphasis on the impact that hard work has. “No team in the world will get anywhere without hard work. It really annoys me when I hear teams saying, ‘oh we can’t compete with that, we need a manager’. Get out and train, get out and do it. Eamon McGee is a man of many talents and interests, and his conversation in the latest Real Talks Podcast sheds light on this. His forthright opinions on working hard and grafting, however, bear particular significance across the board. In all walks of life, as cliche as it may be, you truly only get out of things what you put into them in return. Eamon McGee is an embodiment of this.